Police say thieves have been breaking windows to steal electronics. On Thursday, Hartford Police warned drivers to keep all belongings of their cars. They said there has been a spike in break in’s during the last few months, especially in the southwest part of the city. Investigators told NBC Connecticut, the weather could partly be to blame this winter, because it hasn’t snowed as much as in years past. That has made it very easy for criminals to walk down streets and through parking lots, and look for valuables in parked cars. Those criminals have had a lot of luck, because people have made themselves an easy target. A parking lot on Grafton Street was full of shattered glass on Thursday, after police said someone smashed in seven car windows at an apartment complex overnight. “It was a nasty scene, a real nasty scene,” said neighbor Paul Lauray. 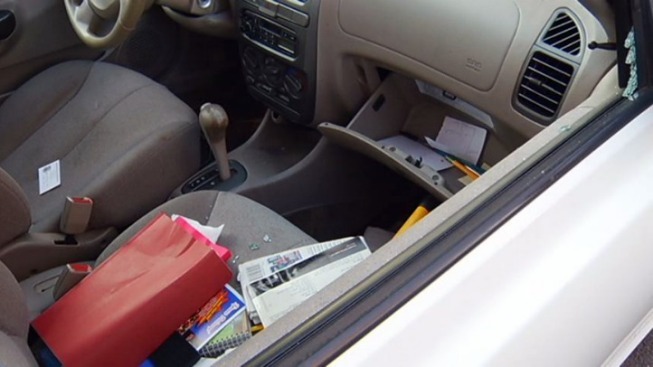 Whoever did this, rummaged through purses, paperwork, and glove compartments, but that was just the beginning. “Some of the hoods of the trunk were open, and clothes were all over the place, stuff was thrown all over the place,” Lauray added. He and his wife woke up to the destruction, along with their neighbors who were in hysterics over getting violated. “I'm worried about the people who got their cars broken into because they're really upset,” said Tracy Johnson Lauray. The victims were upset because many of the victims left their personal information out in the open, that’s now in the wrong hands. “Some of them have pay stubs and things in their glove compartment,” Tracy Jonhson Lauray added. Hartford Police told NBC Connecticut, in some of the cases they’ve investigated over the last few months, a lot of the victims aren’t leaving much in their cars at all. They said many of them have only been keeping their phone charger or GPS connector out in plain view, but criminals assume electronics are inside and they break right in. They want the public to be more aware, and make sure they don’t make a simple mistake that could lead to a break in.